What is POS and why is it used for marketing in-store promotions and campaigns? POS stands for Point of Sale, a type of in-store marketing campaign that can be used in an effective and impactful way of upselling to customers and increasing their spend-per-visit. When implemented correct, a point of sale campaign can be used to build meaningful customer experiences, create brand awareness and generate an uplift in sales naturally without being invasive. Creating a point of sale stand that speaks to your customers is a crucial strategy when marketing your business. Though Point of sale solutions are more prominently seen in retail, other industries that implement POS into their marketing spend are the automotive market, the horticulture market, the travel industry to name a few. Building a successful POS strategy depends on good timing, the right design and most importantly the messaging used in the design. Layout what kind of messages you want to promote to your customers, the more common messages are discount offers, new product promotions and competitions. Marrying your online strategy including discounts and promotions can benefit your brand when you drive your customers in-store. Having a message that is concise throughout the customer journey is essential if you are wanting the customer to convert into a long-term customer. What is the difference between point of purchase (POP) and Point of Sale (POS). Essentially, they both present products to the customer in the same way. However, they are ever so slightly different. Point of sale is an area in a store where a customer completes the last leg of a purchase. The checkout area is a key place where you would usually find POS displays. This is the final stage of a customer’s buying journey, and it is the last point where can you offer a new promotion/ product for the customer to try. Using POS Counter Top displays can persuade customers to part with their cash with another product. Point of purchase is the area strategically chosen for product as it is a customer-passthrough meaning customers pass this point during their buying cycle. Merchandise displays are highly visible here, therefore placing new product promotions is a great way to push sales. A great example of a POP display would be an FSDU that displays promotional items outside of its natural home on the shelf. The purpose of a POP display unit is to draw emphasis and get the customer to take notice of the product. How does POS displays compliment your retail merchandising? In the world of retail, shelf space comes at a premium – and point of sale stands such as free-standing display units (FSDUs) and dump bins are ideal for maximising your store’s merchandising potential. Fitting neatly at the ends of aisles, in corners and around queuing systems, POS display stands are ideal for maximising the use of available space on the shop floor – and more products means more revenue, as bulk-buys and impulse purchases are added to every basket. Choosing the correct in-store POS solution for your store. Whether you are a retail business, an automotive dealership or a garden centre, you need to choose the right unit to display your products and promote your services. 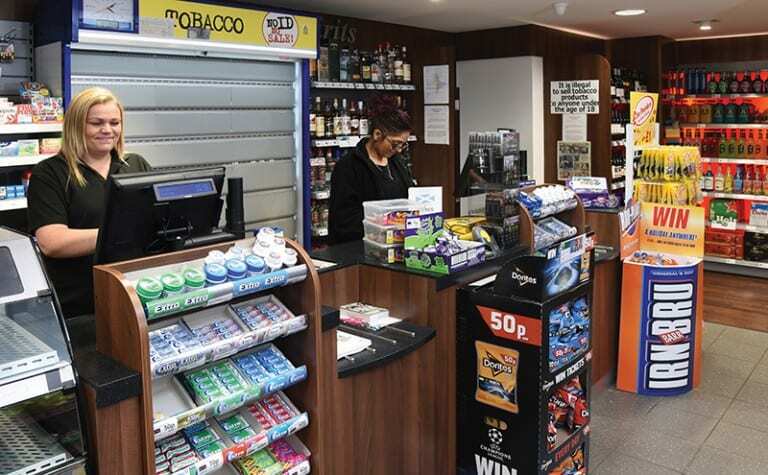 There is a wide variety of POP or POS displays available to choose from – with each option boasting its own unique set of benefits. Whether you want to increase the available space on your sales floor or draw in customers with attractive signage, the selection of retail display stands available, on top of limitless customisation options, means you’re sure to find the perfect solution for your store. These versatile shelving units allow you to catch the customer’s eye and expand your shelf space in one go. Perfect for retail hotspots or queuing systems, they’re ideal for putting large amounts of stock in the customer’s line of sight. In survey conducted by POPAI, 90% of consumers saw a wellbeing display unit displayed in Superdrug. compared to the 80% of consumers who saw a one in Boots. Of the different retailers with FSDUs in their stores, 21% branded FSDUs were seen, compared to a 29% unbranded FSDU, making an FSDU the most seen out of the likes of dump bins, gondola end aisles, shelf displays and counter top units. From large retail spaces to high shelving, a number of factors can reduce your available wall space. Hanging signs are the perfect way to maximise the impact of your visual merchandising. From helping customers navigate the store by hanging them above product locations to highlighting key offers, hanging signs are an affordable and versatile solution for attracting attention. According to POPAI, 40% of retailers visited during Christmas utilised Hung Christmas point of sale merchandise to show off seasonal offers and promotions. These unique displays are visible from all angles when stacked, ensuring you catch the attention of customers wherever they’re looking. They can make an attractive addition to your current merchandising efforts and are perfect for highlighting seasonal goods and special offers.